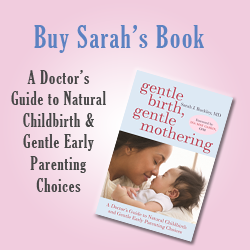 Excerpted from Gentle Birth, Gentle Mothering: A Doctor’s Guide to Natural Childbirth and Gentle Early Parenting Choices (Sarah J Buckley, Celestial Arts, 2009). Whether your baby sleeps in a nearby cot, bassinet, crib or ‘side car’, or shares your bed – there are some general principles that will make your baby’s sleep as safe as possible. These apply to all babies under one. Babies are more at risk of sudden infant death syndrome (SIDS) when they sleep prone; that is, face down. A baby in the prone position can’t get rid of body heat as efficiently, and can’t kick off excess bedding. Both factors can contribute to overheating, a risk factor for SIDS. ‘Back to sleep’ campaigns in many countries have reduced the number of babies dying of SIDS by up to 70 percent. Babies are safest without soft bedding items around them. This includes pillows (no child under one needs a pillow), quilts/doonas/duvets (blankets are safer), crib or cot bumpers (not recommended) and soft toys, all of which can end up over the baby’s head. Sheets need to be tucked in firmly, or fitted snugly so that they can’t come loose. Loose bedding can cover and suffocate. Babies in a cot are safest tucked in firmly with their feet at the bottom of the cot. Co-sleeping babies also need to be kept from slipping under the bedding. An adult mattress for bed sharing may be safer on the floor well away from walls, but you should always ensure that a baby who rolls off is safe from entrapment and injury. Check your baby’s sleep environment for long strings or ties. This also applies to mobiles hung over cribs (cots). It is recommended that bed sharing adults prevent entanglement or strangulation by tying up their hair if it is longer than waist-length. Again, crib (cot) bumpers (with or without ties) are not recommended. It is important to avoid both over- and under-heating. In winter, your baby does not need both very warm clothing and very warm bedding. A solitary sleeping baby can be dressed in a ‘blanket sleeper’ or securely tucked into bedding appropriate to the season. A bed-sharing baby will be kept warm by body contact and also does not need more than one layer of clothing. A cotton singlet or T-shirt, long or short sleeved according to the climate, and a diaper(nappy) is usually sufficient. Natural fibre (cotton, wool, hemp, silk) clothing and bedding is recommended. Also ensure that the room is not over-heated or too cool. Consider whether the heating, bedding and clothing would add up to a comfortable sleeping temperature for you. This means avoiding smoking during pregnancy as well as after birth. Studies show that babies born to mothers who smoked in pregnancy have an increased risk of SIDS, and it is recommended that these mothers do not bed-share with their babies. After birth, keep cigarette smoke away from your baby at all times. For mothers who cannot quit, cutting down will reduce the risk to some extent. Babies are also generally safer from SIDS if the father does not smoke, and bed-sharing with a smoking father may increase the risk of SIDS. If either parent smokes, they can still safely sleep their baby on a separate surface close by. It is also important that bed sharing parents are not under the influence of drugs or alcohol, including prescription tranquillizers and sleeping pills. . These can make them sleep too deeply to monitor their baby’s safety overnight. Adult beds have entrapment hazards, as noted, as well as the danger of suffocation from soft bedding. Your baby is safer sleeping alone in a crib (cot) or in a safe place on a mattress on the floor, away from pets. It is also unsafe to sleep a baby next to a sibling or young child who might roll onto them. Once your baby can sit, lower the mattress if adjustable. Once the baby can stand, put the mattress at the lowest level and ensure that there are no aids to escape – that is, items the baby can stand on or pull down into the crib (cot). A child who is taller than 35 inches (90cm) has outgrown the crib (cot). Not only is this dangerous in terms of falling off, but babies can become entrapped in the gaps of a sofa or chair, which are much more hazardous than a bed, crib or cot. Also check your baby’s carriage or stroller and do not leave your baby sleeping there without adult supervision. Babies can become entrapped or suffocated while sleeping in these, which are not designed for unsupervised sleep. In some studies, breastfeeding has been shown to give added protection against SIDS, which may be greater with more frequent breastfeeding.. Breastfed babies arouse more readily from deep sleep, which may help protect from SIDS. Breastfeeding and bed sharing are also an ideal combination, because bed sharing babies nurse more frequently but with less effort on the mother’s part. This extra breastfeeding provides more nourishment for the baby and benefits the mother by delaying the return of her fertility, acting as a natural family spacing. Sleeping with your baby – the world’s top scientists speak out. Mothering no 114, Sept–Oct 2002, especially the following articles.